Beyoncé has launched Heat Seduction, a new fragrance for women. Heat Seduction is a flanker to 2010′s Beyoncé Heat, and follows 2014's Heat Wild Orchid and 2015's Heat Kissed. The dynamically alluring fragrance opens with an exotic blend of luscious fruits. The heart is a gorgeous assembly of mesmerizing florals wrapped by the sensual background of amber, musk and resins.. The notes include exotic island spice cocktail, mandarin, dewberry, gingerlily, African jungle trail orchid, freesia, amber, musk and labdanum. 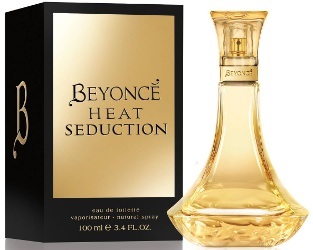 Beyoncé Heat Seduction is available in 15, 30, 50 and 100 ml Eau de Toilette. You forgot Beyonce Heat Rash, I mean Rush. My CVS has had the same bottle on display for years. Love Heat Rash — excellent! And I did leave out lots of them, only listed the most recent. There was also Midnight Heat, Heat The Mrs. Carter Show World Tour and Heat Wild Orchid.